looking down over the resort, you gain a whole new perspective of Windfall and a greater appreciation of what makes this community so special. Phase 3 nearly sold out. Register now. 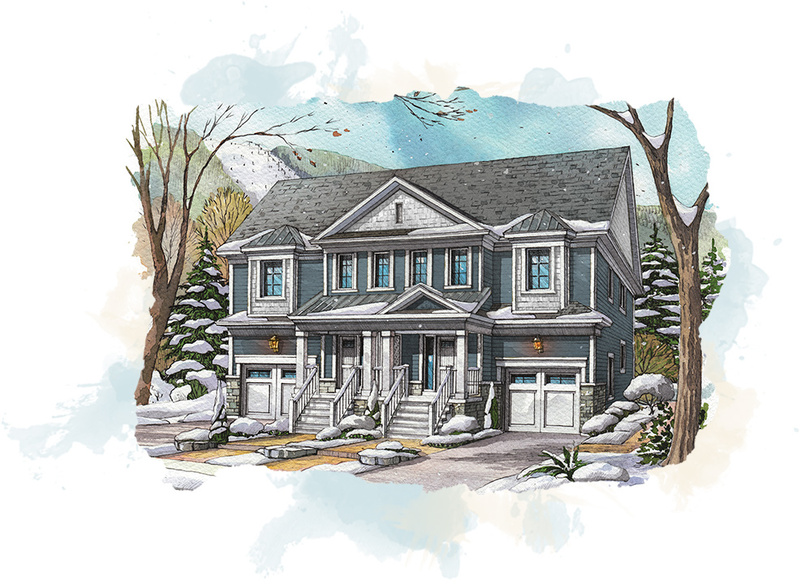 Semi-detached lots now sold out, 2 detached Mountain Home lots remain. Register for Phase 4 today. 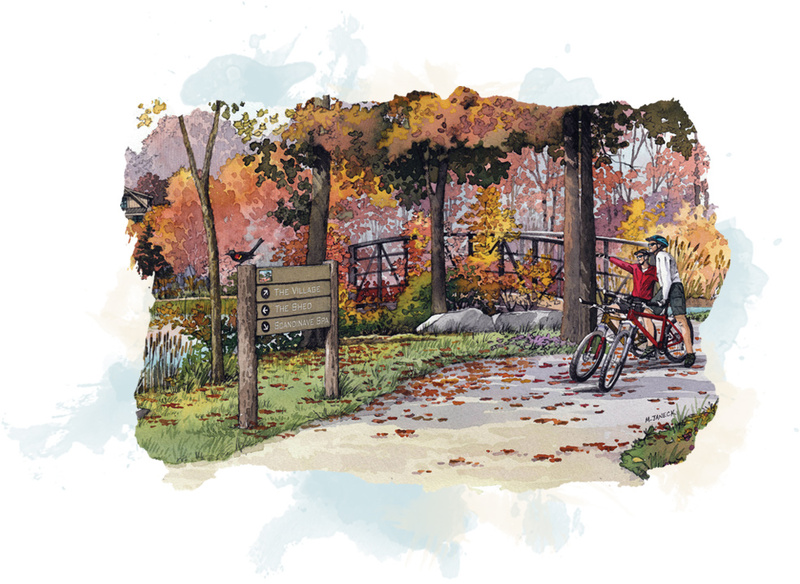 To download our Story Book, please register today. By registering you will be able to follow our progress and have privileged access to information, invitations and exclusive events for future releases. 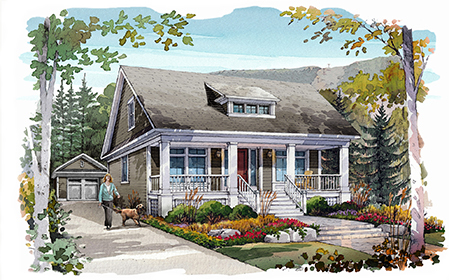 A balance of seclusion with proximity, past with future, and rustic with sophistication. 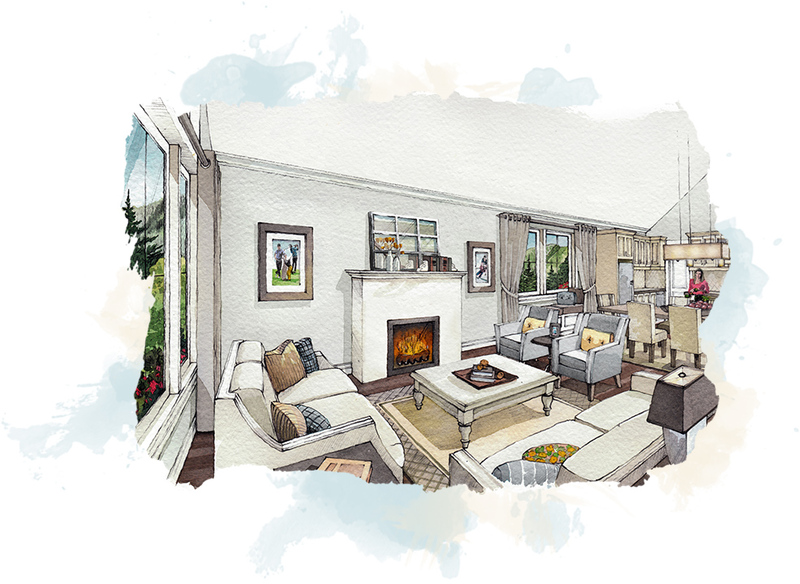 Nothing has been overlooked, from the architectural detailing and positioning of the homes to the color palette we have selected to ensure every home beautifully relates to one another and its environment. 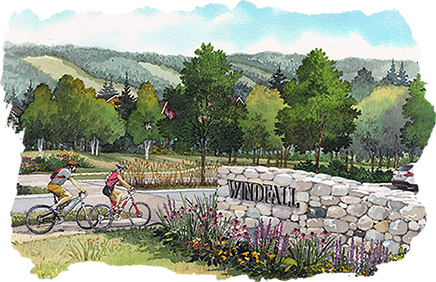 With its aforementioned neighbours, Windfall is already rich in year-round activities and amenities. 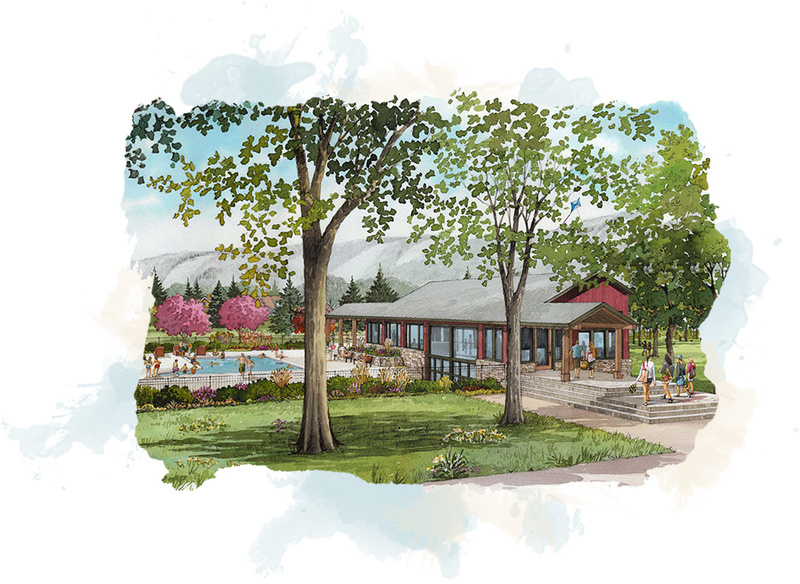 And just for Windfall residents, there will be a barn-inspired, architecturally striking but unpretentious structure in the heart of the community, simply called The Shed, as a year-round social gathering place for all ages. 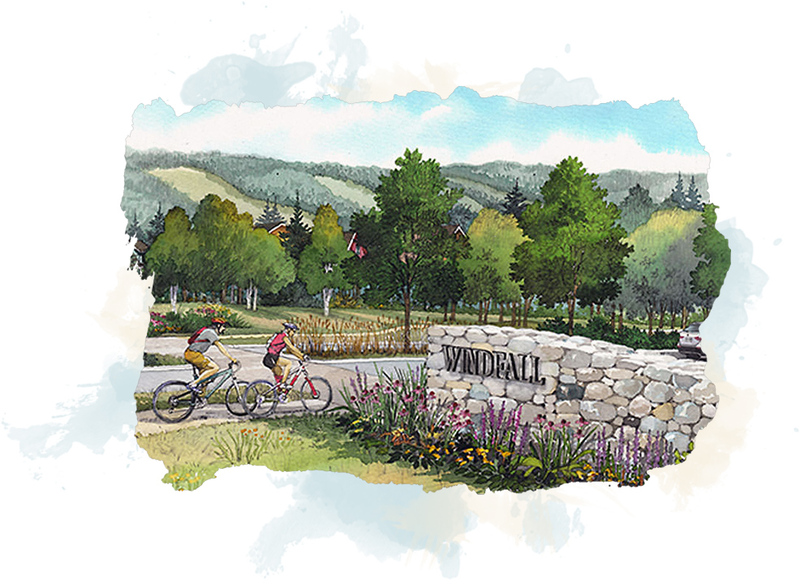 Running through the heart of Windfall is a Nature Corridor, connecting trail systems to neighbourhoods that walkers, cyclists, cross country skiers and snowshoers can follow to cross the community from end to end. 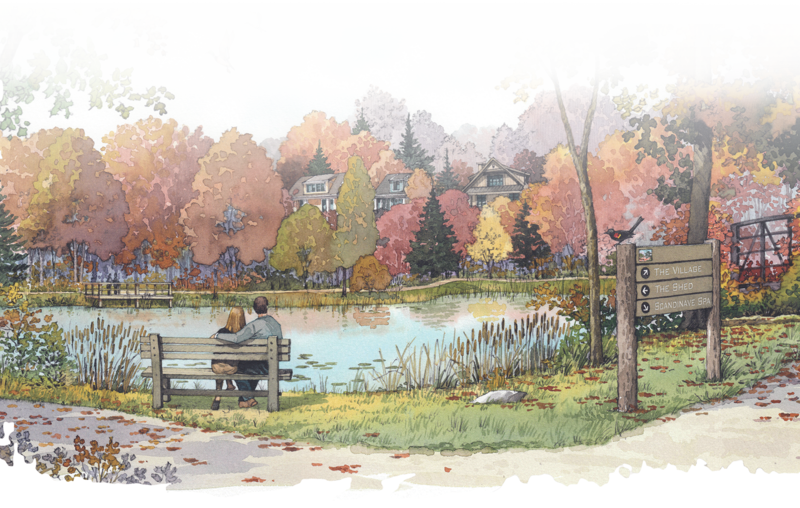 Windfall is at the centre of everything you love about life in the Blue Mountains and in between the most coveted neighbours. After a hard day enjoying skiing, shopping and action at the famed Blue Mountain Village & Resort, it is comforting to know one can relax at the renowned Scandinave Spa Blue Mountain, both of which are located right next door to Windfall. 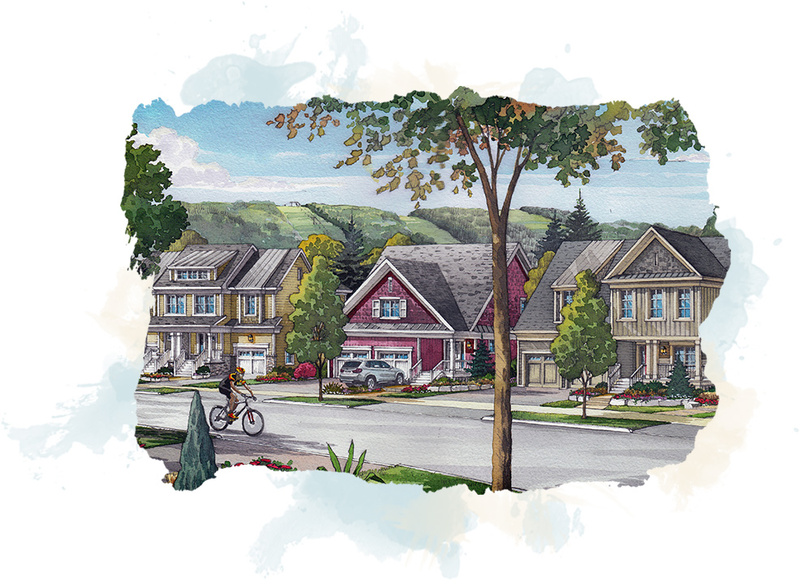 Surrounding historic villages offer quaint art galleries and restaurants, with major retail and healthcare services in nearby Collingwood, and the longest freshwater sand beach in the world just down the road in Wasaga Beach. 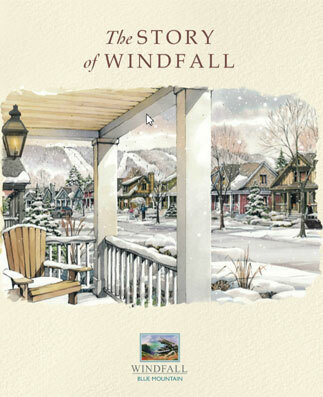 Windfall’s architectural style is an artful modern day interpretation of Georgian Bay cabin, cottage and chalet design — a spirited dialogue between old and new. 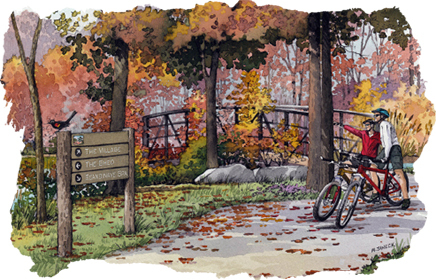 Escape from urban congestion and complexity in a place where nature and neighbourhood are in perfect balance.